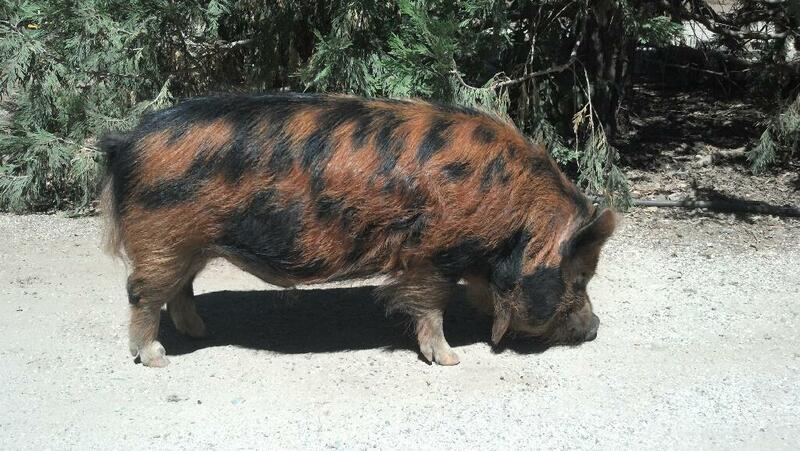 Maybelline apparently decided against a spring litter, but she sure looks pregnant now. 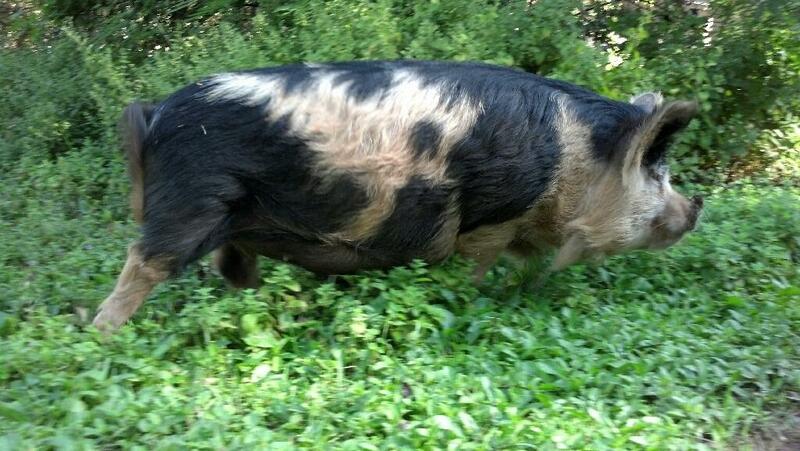 We’re expecting piglets some time in September. 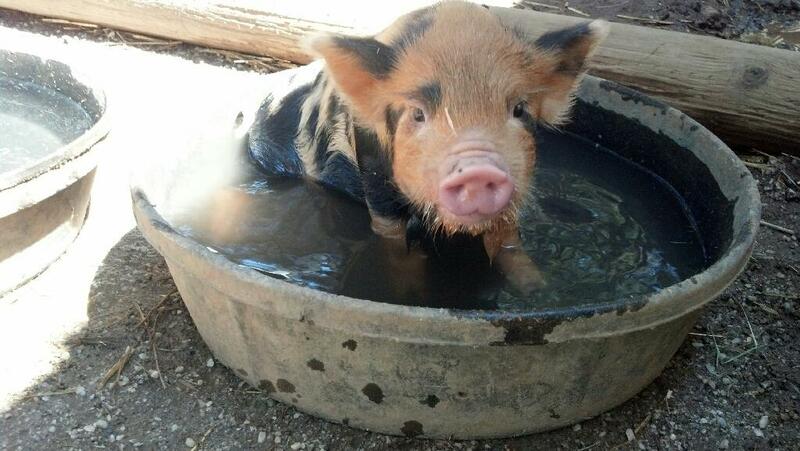 Meanwhile, she is keeping cool in her pond and enjoying eating occasional treats of strawberries, cucumbers, apples, and watermelon slices (without the rind – rinds are not safe for pigs). 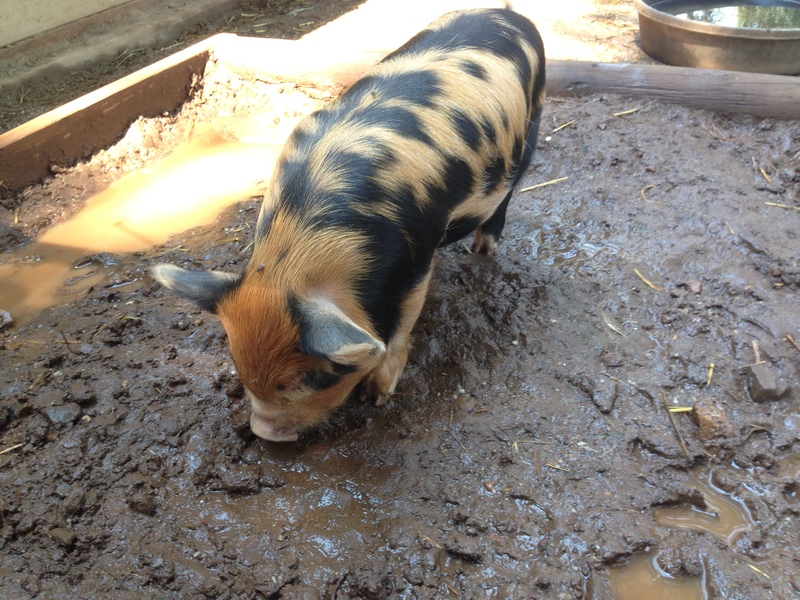 We are expecting more Kunekune piglets this September from our sow Maybelline and our boar Pavarotti. 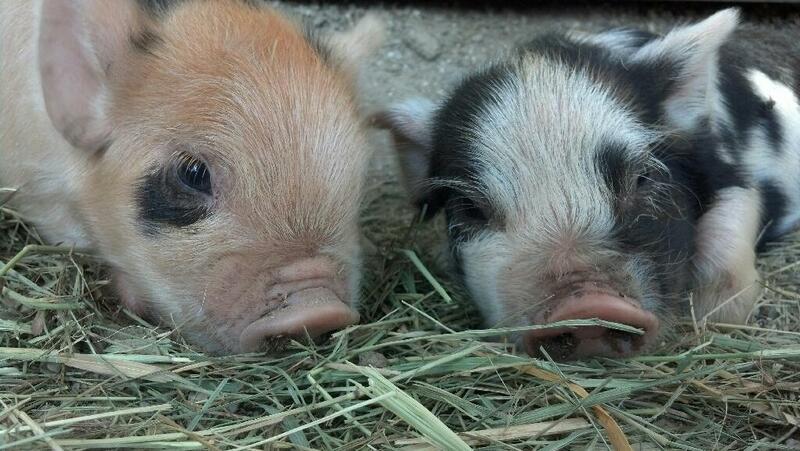 Piglets will be registered Jenny line (females) and Andrew line (males). 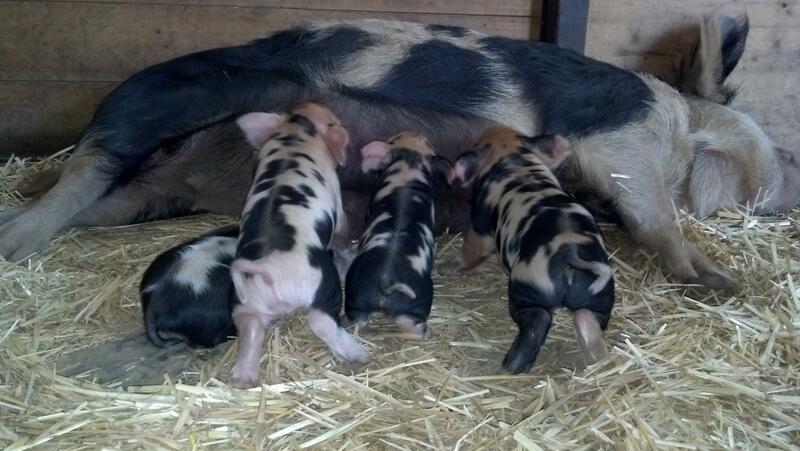 We are now accepting deposits ($250), and the piglets will be ready to go to their new homes in November. 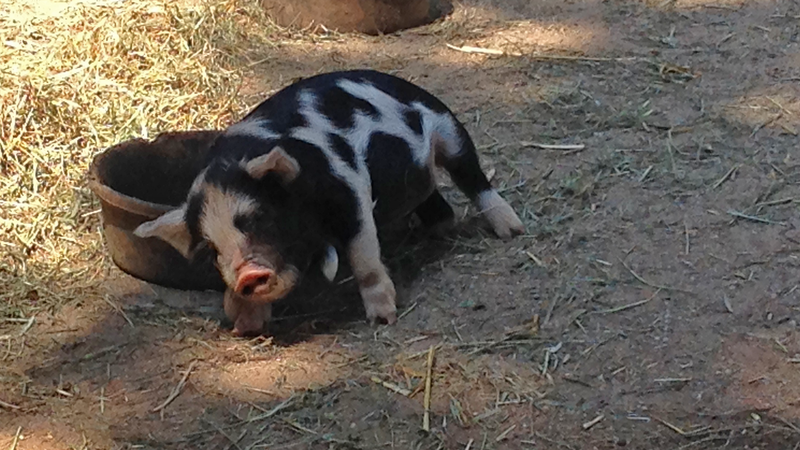 Please email us at murphy-erin@comcast.net or call 530-913-9247 to reserve your piglet! 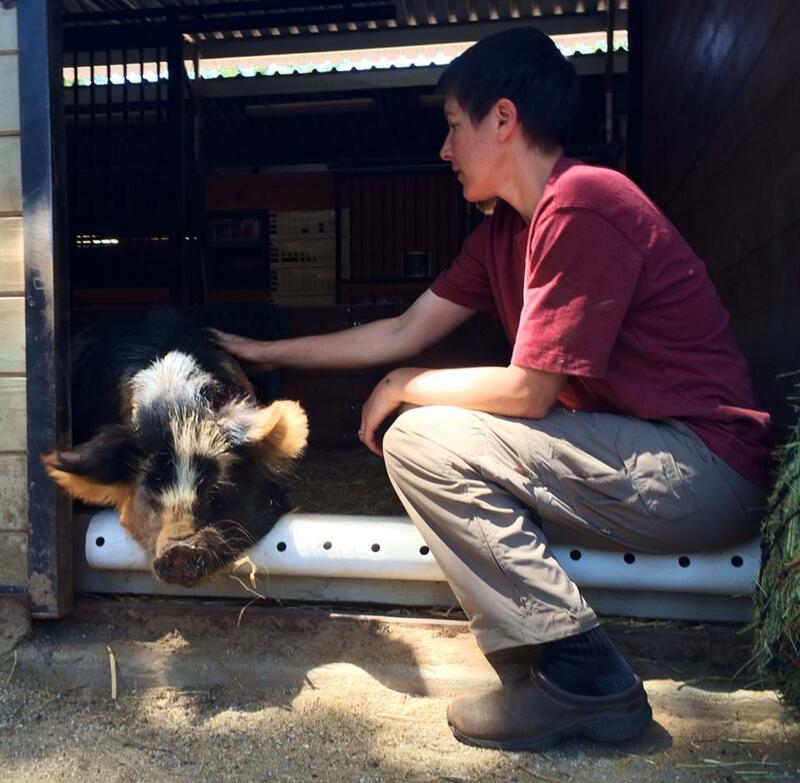 To learn more about Maybelline and Pavarotti, see Meet Our Pigs. 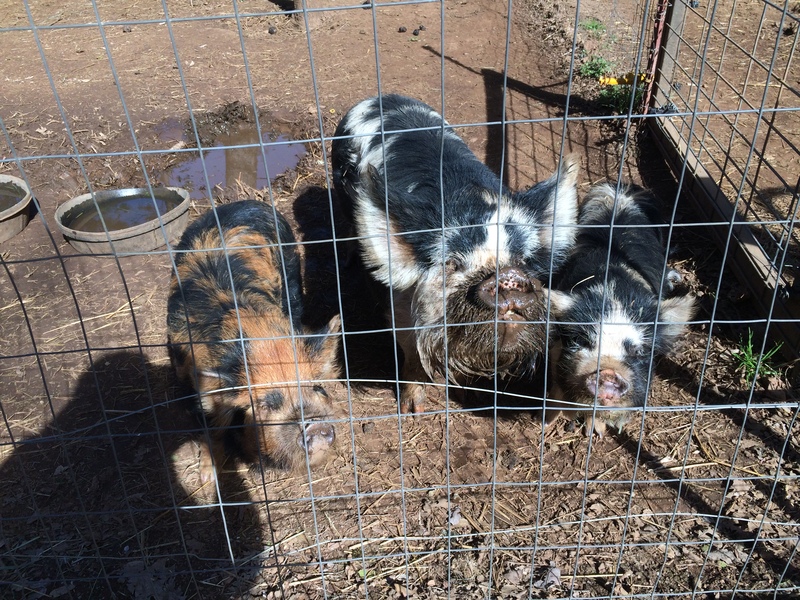 To meet some of Maybelline and Pavarotti’s other piglets, see Buckeye, Poppy, and Daisy. 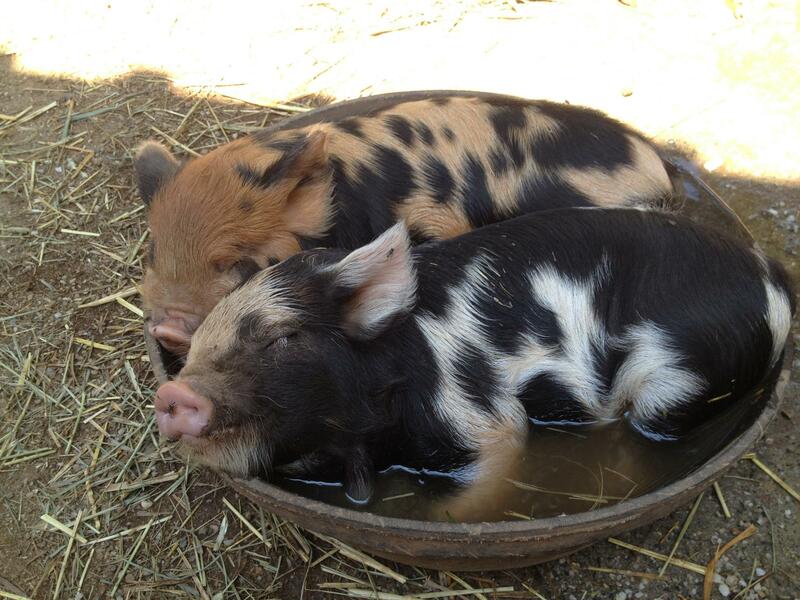 It’s amazing to see how quickly they develop. 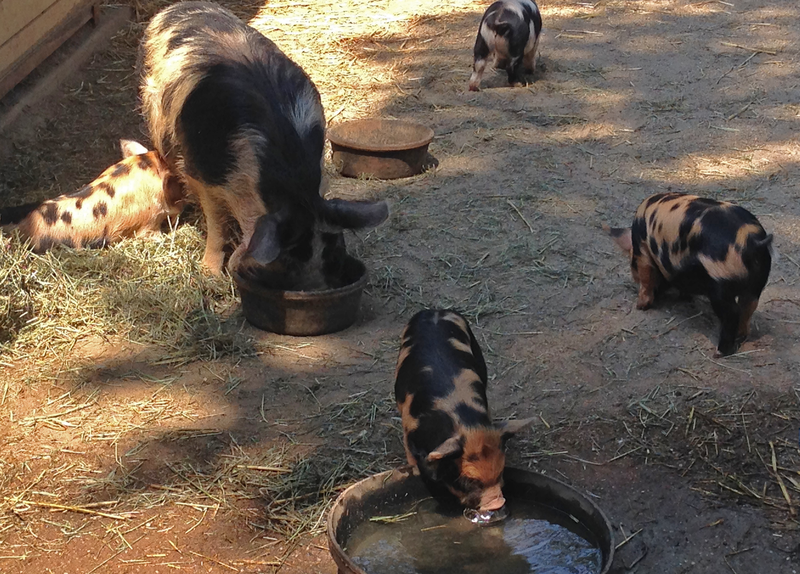 They’re running, playing, nosing around in the straw, and even going outside to use the manure area instead of soiling their bedding. 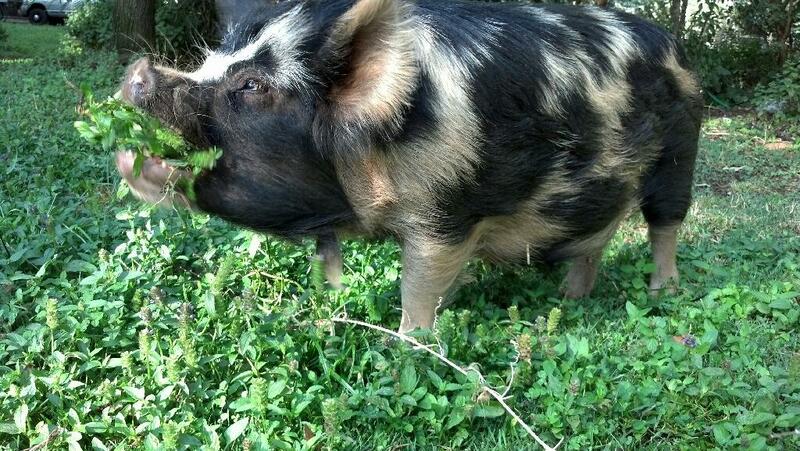 The piglets are independent enough that Maybelline can enjoy a break on the lawn. 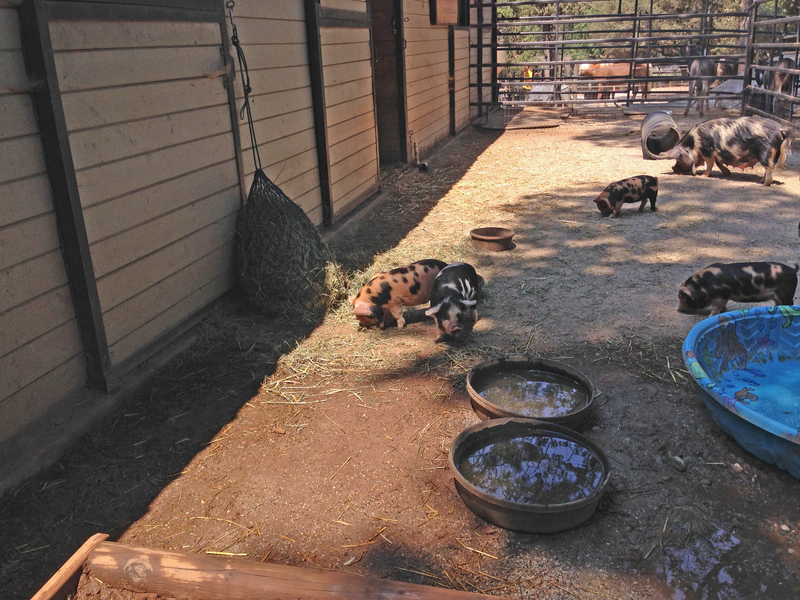 With piglets due on June 28, it was time for Maybelline to move into the nursery — her very own stall and paddock with all the modern conveniences for expectant and nursing mothers. 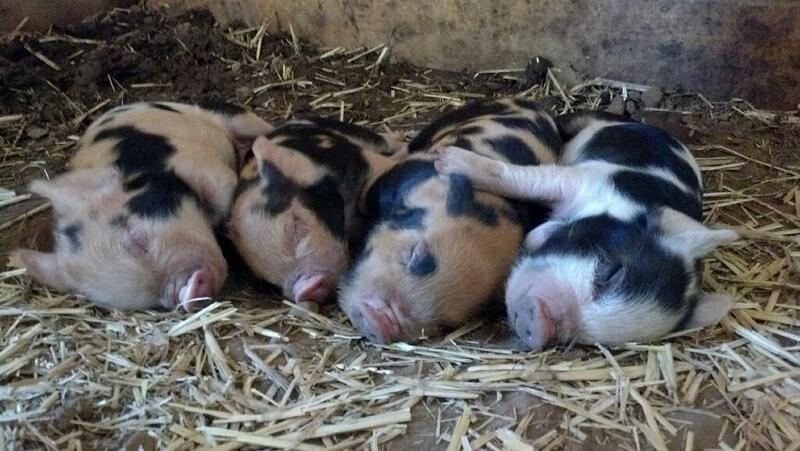 The stall is bedded with straw and equipped with a heat lamp to keep the piglets warm on cool nights. 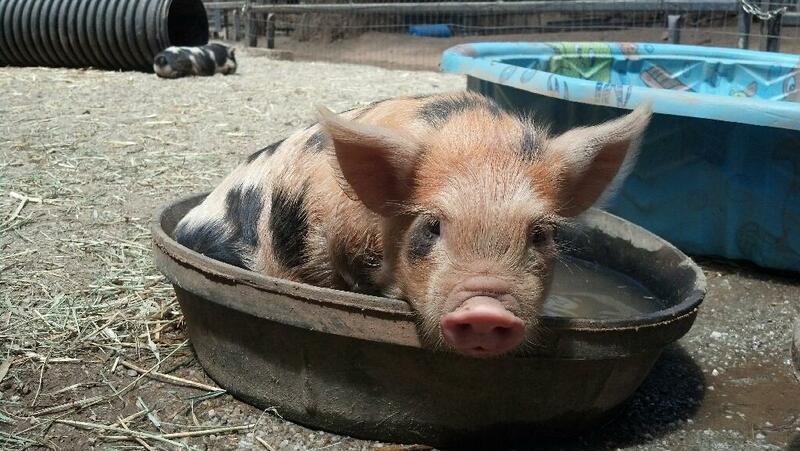 The outdoor paddock provides Maybelline with room to exercise and includes a water mister and baby pool for cooling off in a hot afternoon. 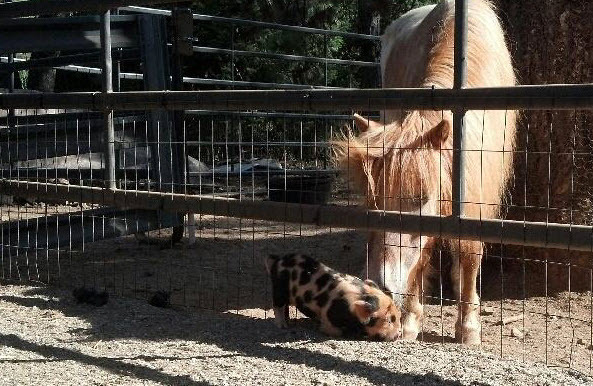 A barrier between the stall and the paddock ensures that the piglets do not go outside until they are big enough to enjoy the privilege. 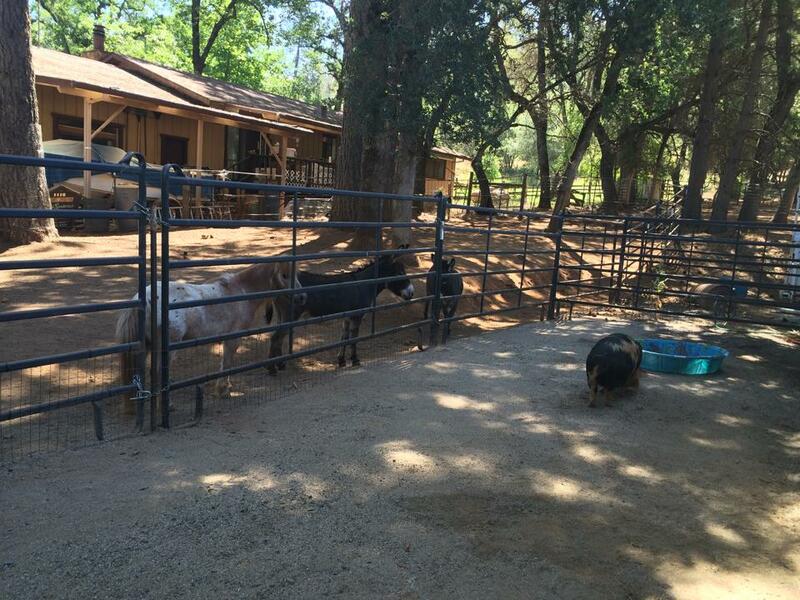 The mini donkeys and pony are curious about their new neighbor.